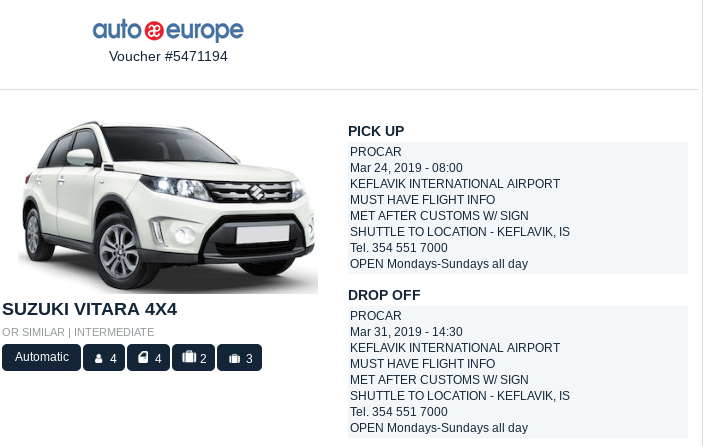 March 24 - Fly into Reykjavik, pick up the rental car and drive to Husafell Hotel. Get some rest. March 26 - Drive to Hella and check-in to Stracta Hotel. Silfra Snorkeling day tour on the way. Snorkel the clearest water in the world. 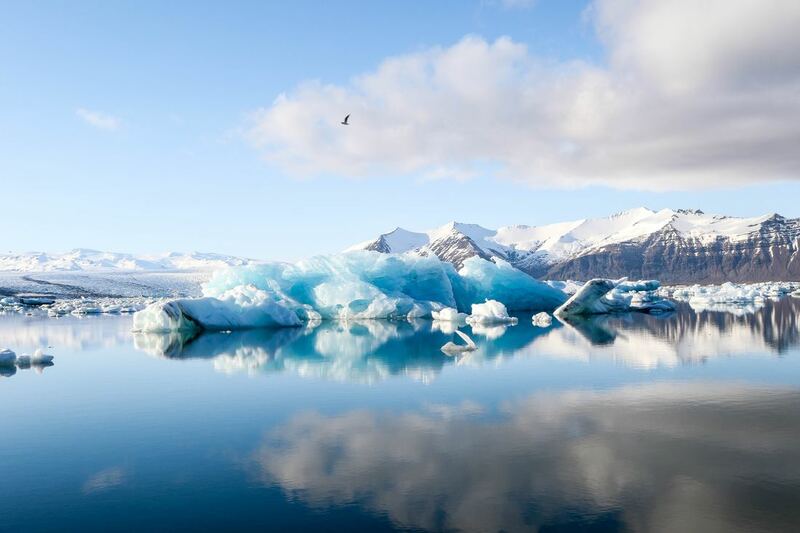 Immerse yourself in the clearest water in the world and float between two continents in Iceland! A snorkeling adventure in the famous Silfra fissure is an unforgettable experience. March 27 - Explore waterfalls today. Consider Foss a Sidu, Fagrifoss, Systrafoss, Skokafoss, and Seljaislandsfoss. March 28 - Check-in to Geirland Hotel. Visit Diamond beach on the way. March 29 - Drive to Reyjkavik and stay at Eyja Hotel tonight. First, hike Sólheimajokull Glacier​. Designed to delight travelers with an adventurous spirit, this 4-hour tour gives you the chance to climb and hike on the colossal Sólheimajökull Glacier. In a small group of no more than 10, you’ll conquer the glacier’s frozen curves and crevasses, and admire unique ice formations and jagged ridges. Refine your climbing skills on an ice wall and receive personalized attention from your guide in an intimate group. March 30 - Explore the area or consider driving to Snaefellsnes. March 31 - Drive to Blue Lagoon before returning the car to the airport and flying home. An otherworldly wonder in the heart of a volcanic landscape. Experience the radiant powers of geothermal seawater. Relaxing. Rejuvenating. Unforgettable. ​It took an hour with Avis to get the car. Hertz line moved much faster. GPS was terrible. Many POI's weren't listed. Also, someone had set the GPS to avoid highways and toll roads (and Avis didn't reset it). Ended up using Google Maps most of the way which wasn't always 100% accurate and did lead us astray at least once. Click here for your voucher. Please print and present when you pick-up the car. Don't forget to remind them that you reserved a GPS. You'll pay for the GPS when you pick up the car. Hotels were nice - Foss Hotel was lovely - modern - good food. Eyja was one of my favorite hotels I have ever stayed in - nice rooms - amazing breakfast buffet, good location, helpful staff. Geirland was simple but clean. Stracta Hotel is a nice hotel. They had a huge buffet breakfast that was great. The room felt smaller for the three of us because we had the sofa bed open so there was no space to move around. I would definitely not send anyone to Hotel Husafell. It is in the middle of nowhere and there is nothing to do there in the winter. The only real restaurant is at the hotel. 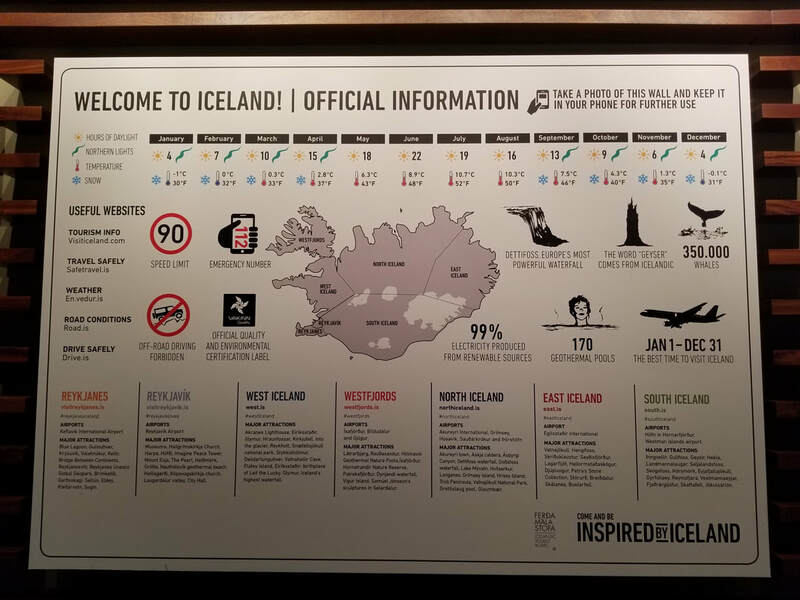 People can take a bus from Reykjavik to tour the ice tunnels and see the waterfalls. All of the tours we did were great. We stopped at Laugarvatn Fontana after snorkeling to use their outdoor hot tubs - was great. Lunch buffet was fair. Click here for your guide to Iceland. Click here to print your voucher. Please bring with you and present at check-in. Silfra is one of the world’s most dramatic snorkeling sites—it’s a glacier meltwater-filled rift formed by the drift of the Eurasian and North American tectonic plates. This tour makes snorkeling the rift as easy as possible by including a guide, dry suit and snorkeling equipment, and Silfra entrance fees. After you’ve snorkeled, you’re offered hot chocolate and cookies.